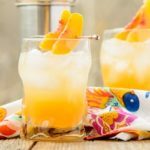 Sparkling Peach Cocktail is made with peach brandy, peach nectar, orange juice, lemon juice, sparkling wine, and garnished with peach slices. Shake brandy, nectar, orange juice, and lemon juice with ice and strain into 2 glasses filled with ice cubes. Top with sparkling wine and garnish with a peach slice.